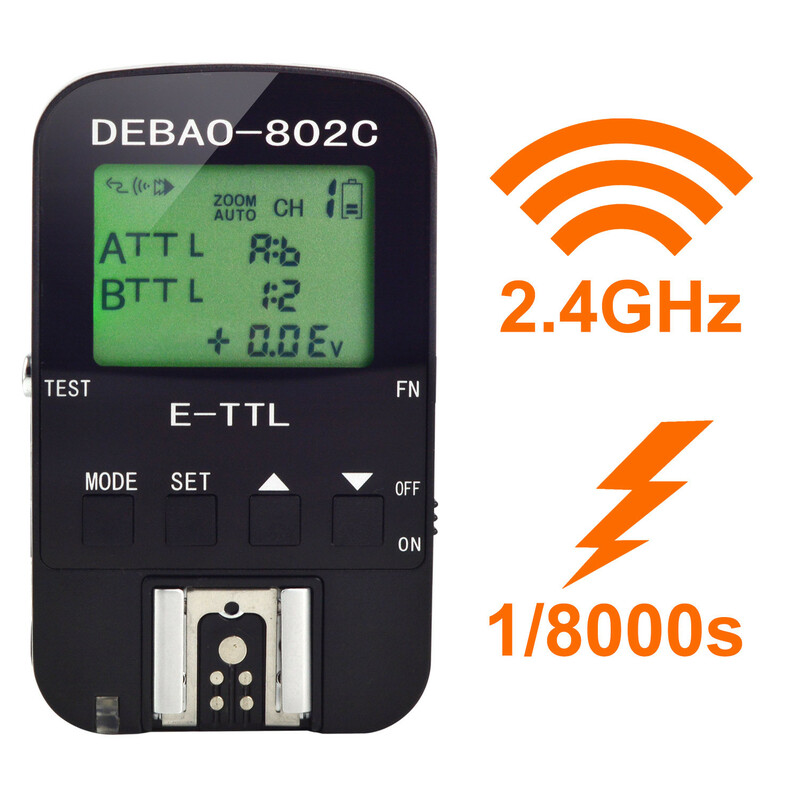 802C high-performance wireless TTL flash trigger, wireless timing shutter combo products, the use of digital FSK 2.4GHz wireless communication system, from the angle constraints, can be arranged at any angle flash, to achieve different shooting. 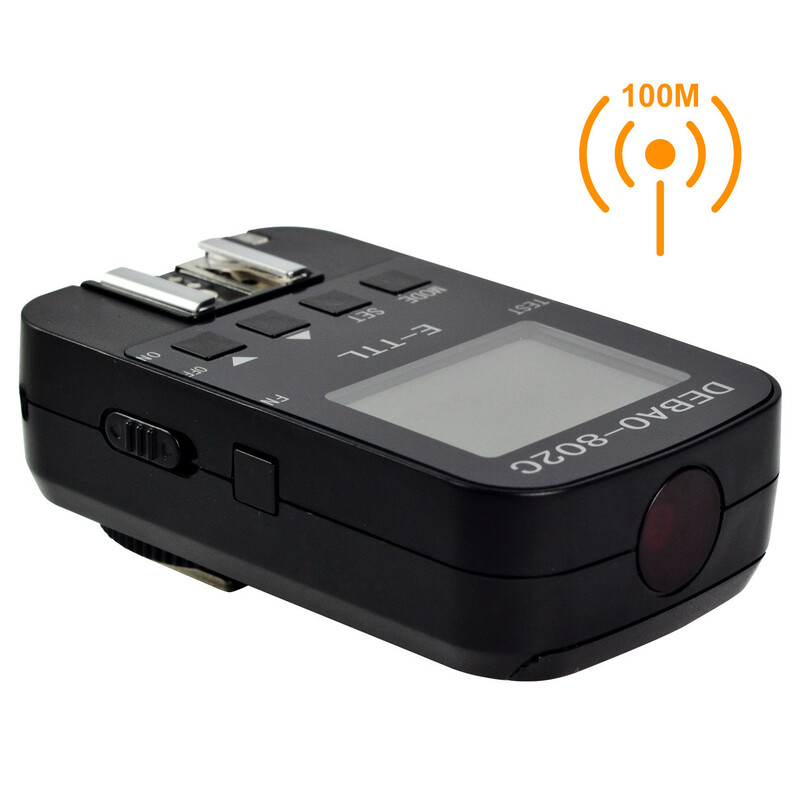 Transceiver design can be set to launch and receive, remote control distance of up to 100M, support 8 wireless channels, wireless flash can be grouped. Canon EOS series SLR cameras that support the external flash function setting menu and Canon EOS series SLR cameras (5D and so on) that do not support the external flash function setting menu can be used to quickly change remote TTL, M and other flash parameters, Flash mode, you can achieve other incompatible cameras (such as Nikon, Pentax, etc.) 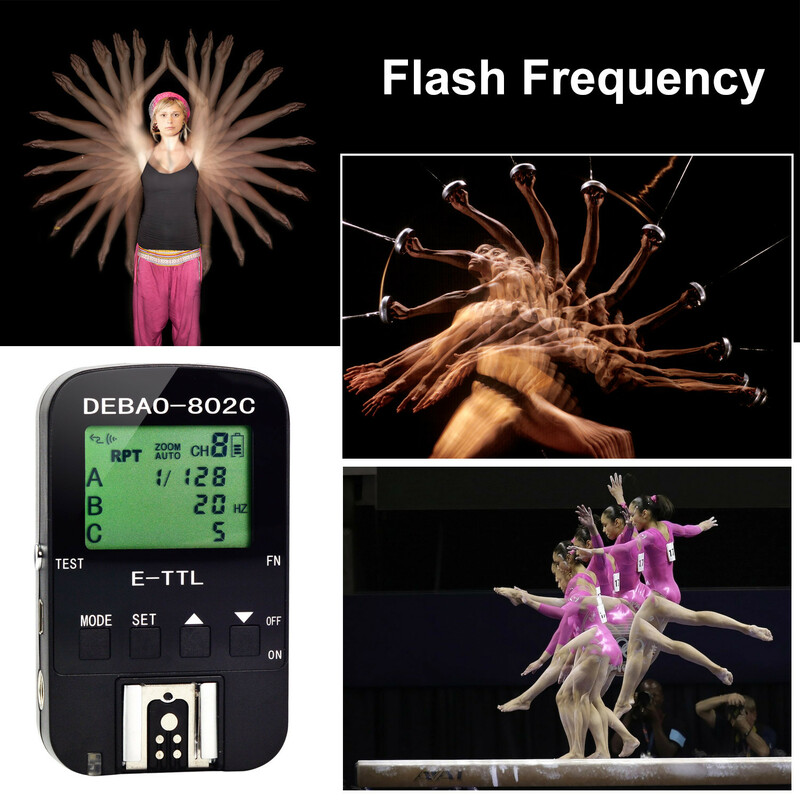 long-range change compatible flash parameters, support front curtain, rear curtain, high-speed synchronization, the maximum synchronous speed 1 / 8000S, Flash mode, can achieve a variety of TTL, M mixed mode flash, support Canon EX II, Meizi, Nissin, Wing Connaught, Wolong, US Branch, color, Jie Bao, God cattle flash and studio lights . 1.Supported flash modes: E-TTL (II), manual, strobe flash. 2.Shutter synchronization: front curtain, rear curtain sync, high-speed synchronization (maximum synchronous speed 1 / 8000s). 4.The flash parameters can be set remotely through the flash interface menu or the camera menu. 5.Support E-TTL, manual mixing (mixed control 1). 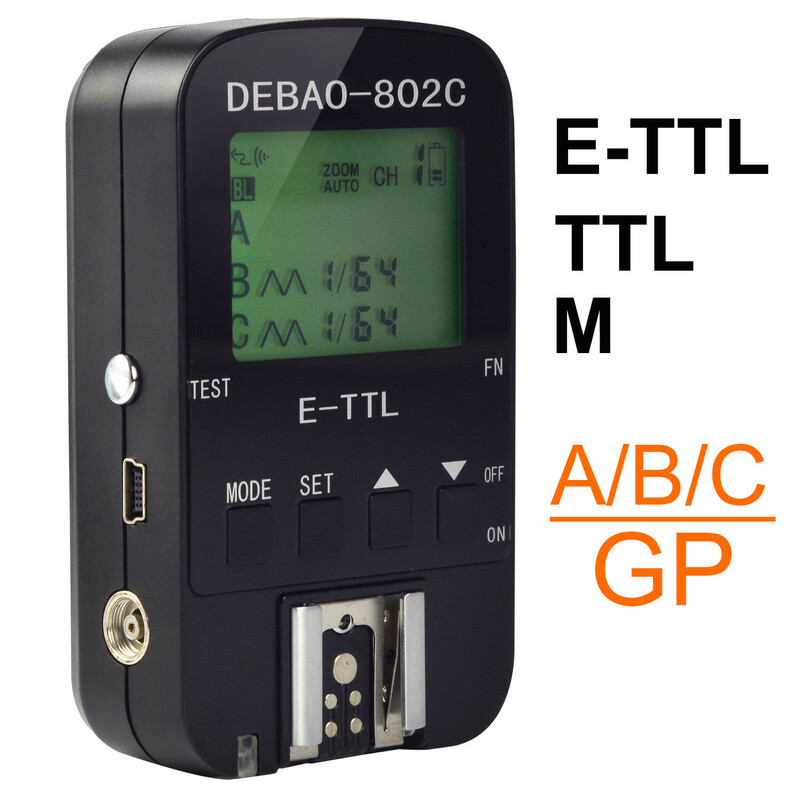 6.Support E-TTL ratio, manual mixing (mixed control 2). 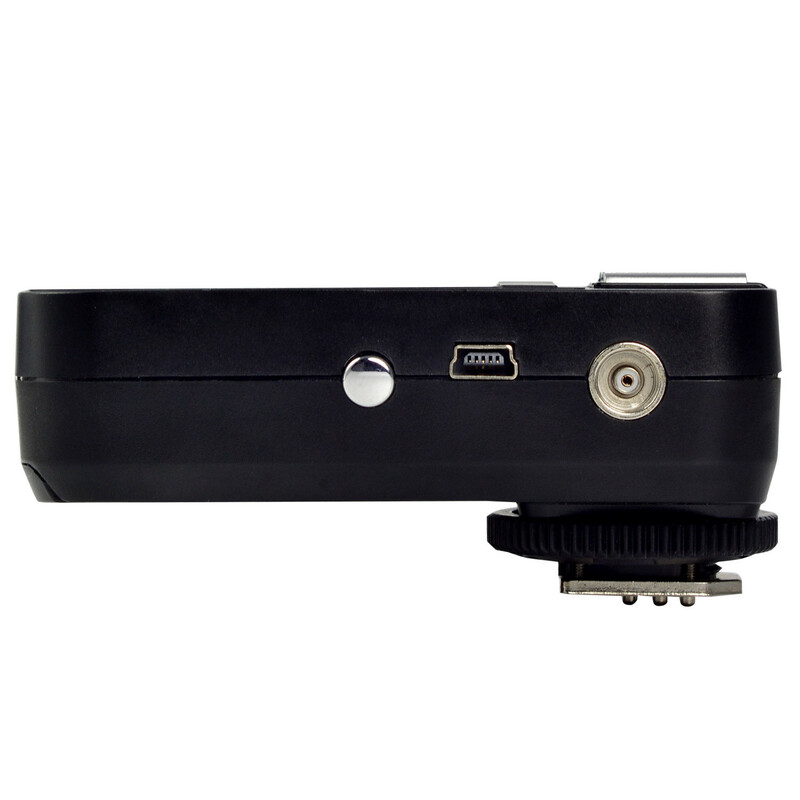 7.Incompatible camera that supports Universal Hot Shot Remote control of flash parameters (M mode). 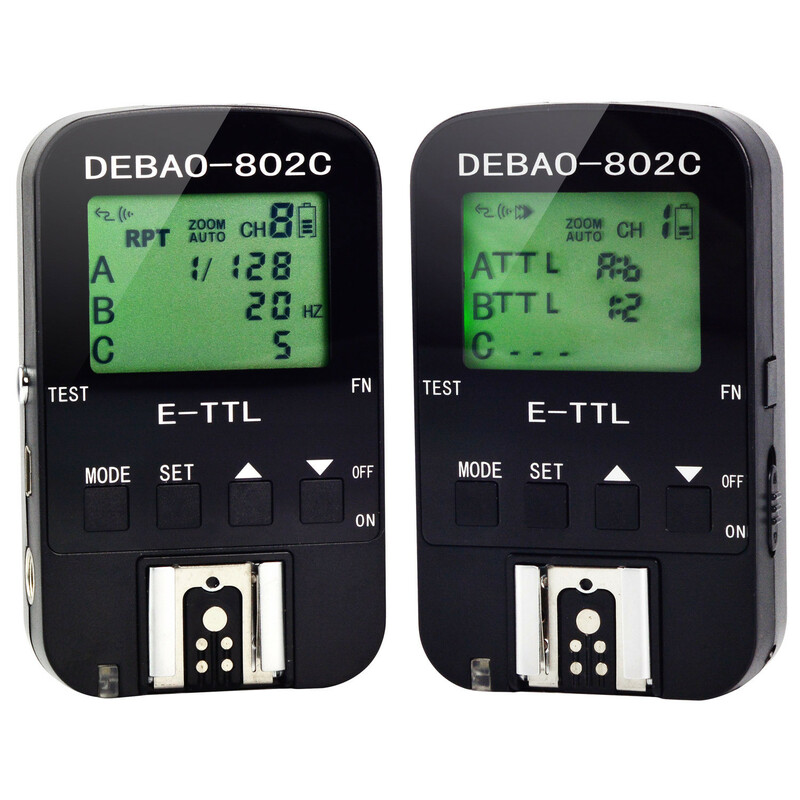 8.Support the transmitter to install the top-mounted flash and support ETTL function. 9.Support for exposure compensation (FEC), bracketing (FEB), exposure lock (FEL). 10.Support flash head zoom (each group can be set automatically, manually). 11.Set the auto save function. 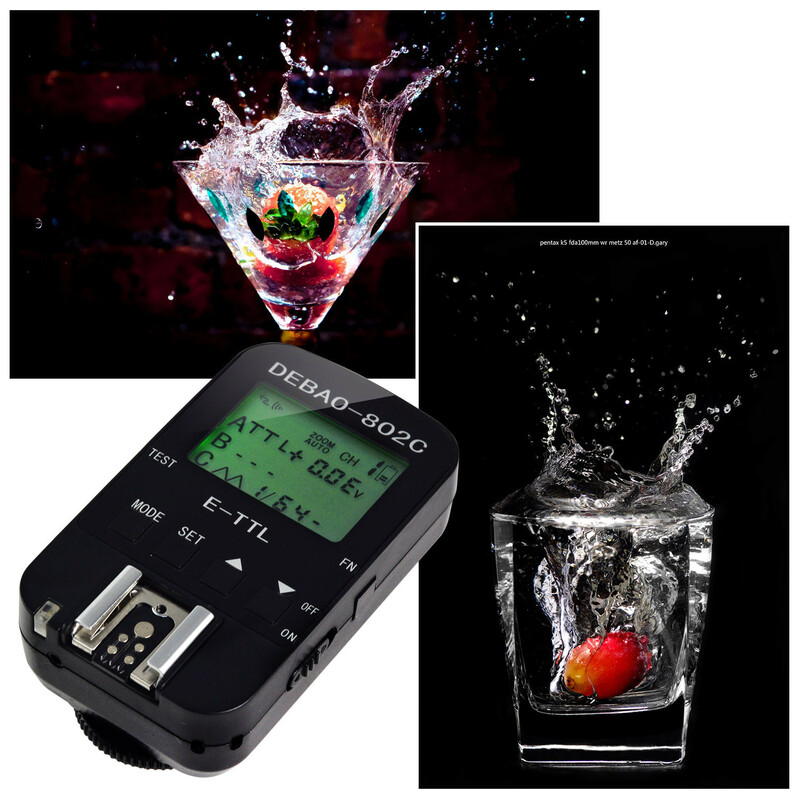 12.Support depth of field preview modeling lights flash and auxiliary focus lamp function. 13.Support PC interface to trigger studio lights, and support the first curtain sync, rear curtain synchronization, high-speed synchronization. 14.support high-speed continuous shooting trigger flash. 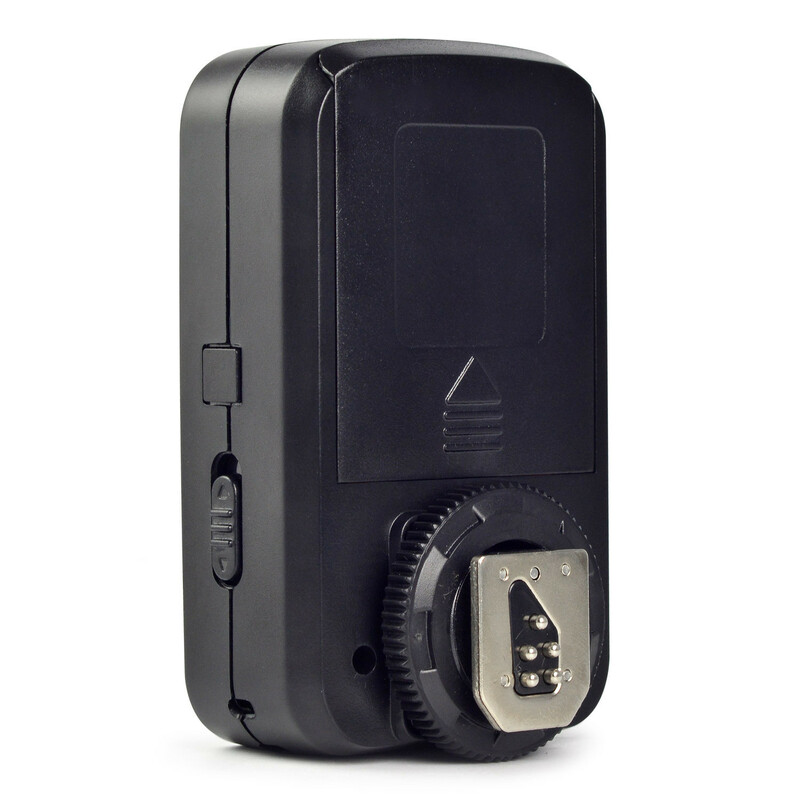 15.support for wired shutter, wireless shutter, wireless timer shutter function. 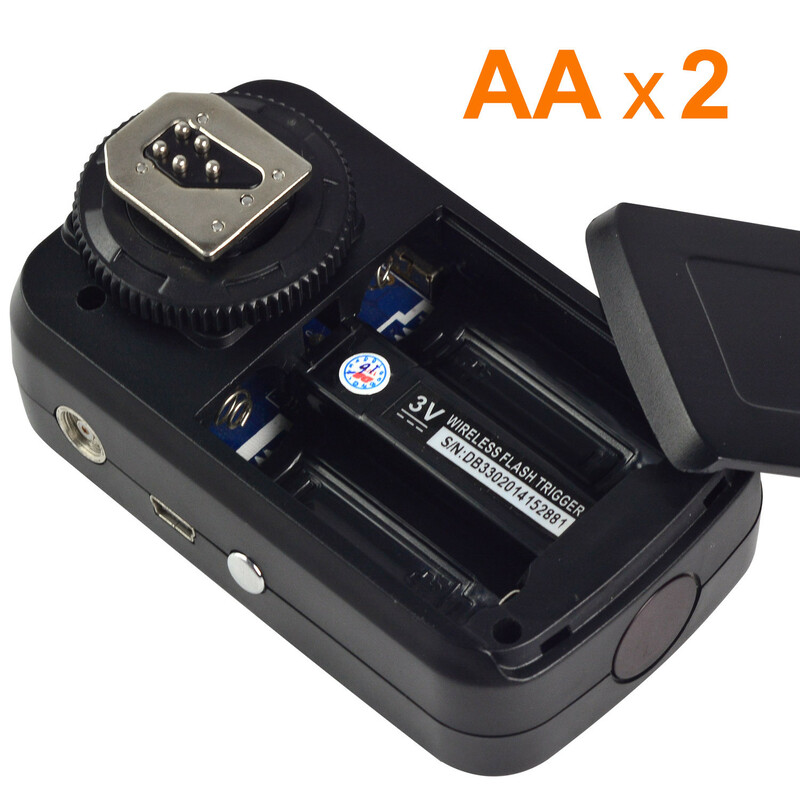 16.Compatible with Canon’s full range of EXII flash, Yongnuo, Wolong and other third-party flash. 17.Support single-contact camera and non-Canon brand camera (synchronous speed of 1 / 250s), M mode data transfer and flash.